This week we had an unexpected fire drill...even the Principal and secretaries were caught by surprise! Our school hosts a mobile food pantry each month which is a wonderful service in which local qualifying residents can receive food for free. It's an excellent program and after a somewhat slow start, it's grown substantially. A member of the community was waiting in line in our gym and was holding a baby. The shiny red fire alarm handle must have caught the baby's eye because all of a sudden, the alarm was pulled, and we were heading outside...in the misting rain. As we stood outside and checked in with our fire drill checkers, we began to hear the sirens...the fire department was on their way! The fire department is a fairly short distance from my school so we were practically able to hear them leave the station and head our way. It became a TEACHABLE moment as the students began to look a bit frightened and confused. I assured my students that this was, indeed, a drill and WOW! Look how fast the fire department responded! My student nodded in agreement and whispered "They are SO fast!" The trucks showed up, checked in with our Principal, and were swiftly on their way back to the station. It made me feel so good to know that if there ever WAS a fire or an emergency at our school, they would be there in a flash! Remarkably, as exciting as that was, we were able to fall right back in to what we were doing before the drill. Our Principal came over the intercom to let us know what happened and to reaffirm that we were so thankful for these quick responders. Although we have practiced fire drills a couple of times, I think I'm also going to show my students this presentation to help reinforce what to do. As a side note: one of my students who has a particularly hard time with fire drills was able to participate in the drill BEAUTIFULLY! I'm so proud of this little guy and the progress he has made! 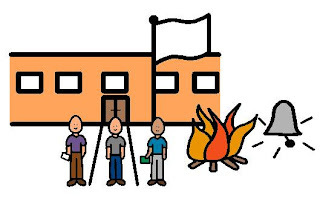 Do you have any tips for reinforcing fire drill procedures?